In Balanced Achievement’s ‘The Weekly 5’ series, we aim to present you with five ideas that you can utilize to enhance the quality of your life or illuminate five important aspects of the spiritual and/or psychological fields. We examine a wide variety of topics with information that can assist you on the road towards fulfillment in a fun and entertaining way. This week, we look at five of the most breathtaking temples in India. Throughout the enchanting lands of India, there is an unquenchable thirst for spiritual practice that’s endured for hundreds of centuries. From the snowcapped Himalayas in the north to the southern ocean waters off the coast of Kanyakumari, spiritual seekers fervently consume transcendental teachings with hopes of enriching themselves from the inside out. While the vast majority of the nation’s 1.3 billion people are associated with the Hindu religion, a number of the world’s other great religions, such as Buddhism, Jainism and Sikhism, have their historical roots in India and add to the country’s unmatched mystical ambience. In addition to supplying us with some of the world’s most celebrated scriptures and noteworthy religious figures, these four great faiths are responsible for the creation of a wide variety of truly wondrous temples which we aim to present to you here. To start our exploration, we’ll first illuminate five icon Hindu temples before moving our attention towards one monumental place of worship for Sikhs, Buddhists and Jains. Although there isn’t an exact count of Hindu temples in India, some religious scholars estimate there to be well over 500,000 that are individually dedicated to any number of the religion’s 33 million Gods. As you can probably assume, highlighting only five without overlooking a seemingly endless number of the country’s wondrous temples really isn’t possible to do. For this article, instead of solely illuminating the religion’s most well-known places of worship such as the Venkateswara Temple in Andhra Pradesh and the Vaishno Devi in Jammu and Kashmir, we’ve aimed to present iconic structures with a balance of historical significance and striking visual appeal. If you’re interested in exploring Hinduism’s most famous and visited temples, there are a wide range of websites which present them in great detail. Although it is easy to assume that a ‘temple’ is comprised of a single building alone, the Meenakshi Temple in the southern India state of Tamil Nadu contradicts this notion as it covers almost 15 acres of land and features an immense complex containing numerous structures and spiritually significant sites. The Temple, which is dedicated to the Goddess Parvati in the form of her avatar Meenakshi, is located within the heart of Madurai, nicknamed the Athens of the East, and is considered to be one of India’s truly historic and breathtaking gems. Despite the fact that the temple’s 14 stunning gopurams, or towers, featuring most of the complex’s 33,000 precisely detailed religious sculptures are what draws the attention of an estimated 15,000 daily visitors, the temple’s central shrine, sacred tank known as the ‘Golden Lotus Pond‘, and ‘Hall of 1000 Pillars‘ are of outmost spiritual importance. While the majority of the temple’s present architecture was built between 1623 and 1655, historians believe that the original temple was built in the 6th century BCE. Thanks to its rich religious history and stunning visual appeal, the Meenakshi Temple was more recently featured as one of the top 30 nominees for the Travel Channel’s list of ‘New Seven Wonders of the World’. 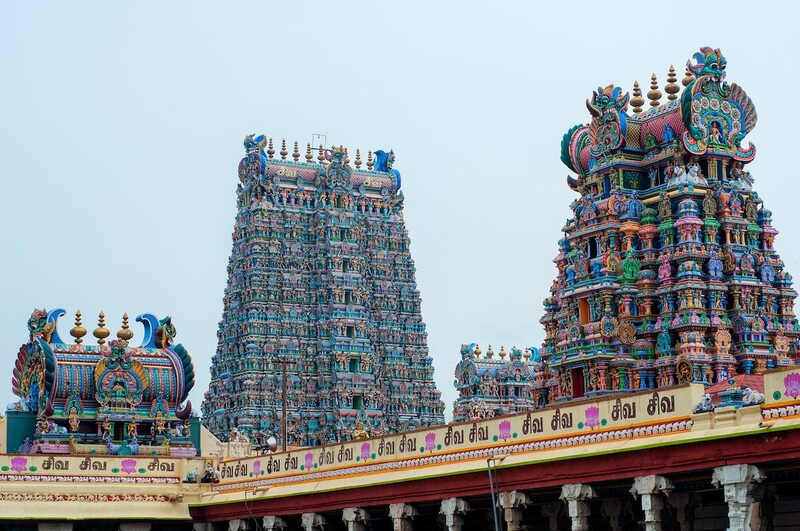 (The featured image above also shows the Meenakshi Temple). Sprinkled across the enchanted lands of India are said to be 12 spiritually significant Jyotirlingas, or devotional shrines that radiate the presence of Lord Shiva, with the one closest to the revered God’s eternal abode being found at the Kedarnath Temple in the northern Indian state of Uttarakhand. Sitting at an altitude of 11,755 feet (3,583 meters), the impressive stone temple, which is also considered to be one of the four holy destinations on the Chota Char Dham pilgrimage circuit, offers spiritual seekers an awe-inducing experience unlike any other thanks to its picturesque location near the Mandakini River in the Garhwal Himalayan range. Due to the steep elevation and fierce winter weather, however, it’s only possible to visit the temple by trekking uphill 11 miles (18 kilometers) during a six month period that falls between spring and fall. Earlier this year, on May 2nd, the celebrated temple made headline news as India’s Prime Minister Narendra Modi became one of Kedarnath’s first prayerful visitors of the season. Although the exact date of when the historical temple was built is unknown, it is believed to be sometime during in the late 8th century. Around 6.2 miles (10 kilometers) from the state of Rajasthan’s capitol city of Jaipur, the Pink City, is an ancient pilgrimage site known as Galtaji where visitors can find an assortment of beautiful and exotic temples. While the most well-known temple found in the town of Khania-Balaji is the Temple of Galtaji itself, there are a number of other noteworthy places of worship within it’s vicinity, and together the collection offers a truly wondrous experience. It was in the 18th century when the exquisite Temple of Galtaji was built within a mountain pass of the scenic Aravalli Hills from the same pink stone that adorns much of Jaipur. Inside the temple, visitors will certainly become immersed with eloquent painting, sculptures and architectural design, yet the temple’s most significant feature comes in the form of 7 holy kunds, or tanks filled with natural spring water, which are said to auspiciously bless those who bathe in them. In addition to the main temple, others in Galtaji such as the Sun Temple and Galwar Bagh draw the attention of visitors. Galwar Bath, commonly referred to as the Monkey Temple, has become especially distinguished because of the numerous clans of monkeys who call it home. Situated off the coast of the Arabian Sea, in the southwestern Indian state of Karnatka, is a small town known as Murudeshwar where a beautiful temple and mesmerizing statue of Lord Shiva can be found. The Murudeshwar Temple, which was imaginatively built to be surrounded by water on three of its four sides, is an important place of worship for Hindus because the main deity, Sri Mridesa Linga, is believed to be a mystical manifestation of Shiva himself. The temple’s magnificent entrance tower stands at 249 feet (76 meters) high, the second tallest in India, and is covered with a plethora of extravagant religious sculptures. It’s from here where visitors can take a lift to the 20th-story for a breathing view of the word’s second tallest Lord Shiva statue. Unquestionably, the magnificent view, from atop the Murudeshwar Temple tower, of the 123 feet (37 meters) tall statue, which costs nearly $1 million to build, will leave visitors of all religions in a state of bewilderment and awe. In addition to housing the celebrated Murudeshwar Temple, the southwestern Indian state of Karnatka is home to variety of other legendary and wondrous places of worship. While the state is probably best known for the ancient Virupaksha Temple in the mountainous town of Hampi, there may not be a more stunning collection of temples than the ones found in Badami. More specifically, the two individual temple collections known as the Badami Cave Temples and the Bhutanatha Group of Temples are what leave visitors in a state of deep admiration. The Badami Cave Temples, which are historically significant to the religions of Hinduism, Jainism and Buddhism, are comprised of five individual temples built into the town’s natural sandstone hills. Because these cave temples are thought to be some of the earliest examples of Hindu temple architecture, dating back to the 6th century, UNESCO (United Nations Educational, Scientific & Cultural Organization) has designated them as a Word Heritage Site candidate. Not to be out done, the similarly magnificent Bhutanatha Group of Temples, found within walking distance of the caves, are made up of only two temples with the main Bhutanatha Temple being the biggest draw. Thanks to the temple’s beautiful color, open architectural design, prehistoric look and unique location, the Bhutanatha Temple is assuredly one of India’s most wondrous. It is believed that different structural components of the temple date back to the 7th and 11th centuries respectively. Although Sikhs account for only 1.72% of India’s population, their most significant pilgrimage site is one of the country’s most celebrated destinations. The Harmandir Sahib, or Golden Temple, is located in the Punjabi city of Amritsar, 20 kilometers from the Pakistani border, and draws over 100,000 people each day. While the Golden Temple assuredly leaves nearly every visitor in a deep trance, it is actually the body of water that the temple seemingly floats on top of that is most historically significant for Sikhs. In 1577, The fourth Sikh Guru, Ram Das, founded the city of Amritsar and built the tank which is now believed to have healing powers. It wasn’t until the fifth Sikh Guru, Guru Arjan, build the spectacular temple in the center of the mystical body of water. The temple itself was built with an enchanting mixture of Hindu and Islamic architectural styles before being covered in pure gold. Visitors of all religions are free to venture inside the breathtaking house of worship for short periods of time where they’ll find priest and musicians chanting spiritually transcending tunes from the Sikh’s holiest book, the Adi Granth, which also rests within the temple walls. Although Diskit Monastery isn’t technically classified as a temple, it’s pristinely beautiful location in the Himalayan Mountains of the Nubra Valley, at an altitude of 10,315 feet (3,144 meters), make it worth mentioning here. Of course, it’s worth noting that India is home to three out of the four most important Buddhist pilgrimage sites, in Bodh Gaya, Sarnath and Kushinagar, yet smaller mountain villages like Diskit truly personify the Buddhist way of life. It was in the 14th century when Changzem Tserab Zangpo founded the monastery, also called Diskit Gompa, which today houses around 100 monks and runs a school out of the facilities with the help of the Non-Governmental Organization (NGO) Tibet Support Group. Additionally, a number of other significant religious sites have been built in the surrounding area over the course of Diskit’s history. While the Lachung Temple and Hundur Monastery are worth mentioning, the icon 32 meter (106 feet) tall Buddha statue makes the village really stand out. Construction of the mesmerizing statue, which sits below Diskit Monastery, started in 2006 and was consecrated by none other then His Holiness the 14th Dalai Lama on July 25th, 2010. When looking at the popularity of Jainism in India, in addition to their holiest pilgrimage sites, a number of similarities with Sikhism can be found. Just as a small percentage of India’s population is comprised of Sikhs, 1.7%, an even smaller percentage, 0.4%, is made up of Jains. Yet still, just as the Sikhs consider one of India’s truly magnificent temples to be their holiest pilgrimage sites, so to do the Jains with the Palitana Temples that sit atop the Shatrunjaya Hill in the state of Gujarat. To reach the summit of the sacred ‘hill that conquers enemies’, which sits 164 feet (50 meters) above sea level, visitors must make a grueling two hour trek up 3,572 steps. What awaits, fortunately, is a truly breathtaking sight of more than 900 perfectly sculpted white marble temples. The location of the site was chosen because some of the religion’s most important leaders gave sermons, meditated, and attained spiritual liberation here. Yet still, what’s potentially most amazing about the collection of Palitana Temples is that they were built over a period of 900 years starting in the 11th century.